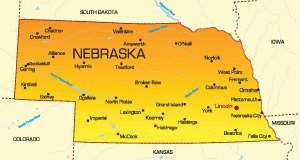 Nebraska is a state in the heart of the Great Planes of the Midwestern United States. The state is nicknamed the Òcornhusker stateÓ and has a population of nearly 2 million people. The bordering states are Missouri, Iowa, South Dakota, Kansas, and Colorado. The capital is Lincoln but the largest city is Omaha, which is home to 400,000 people. Major highways servicing the state are I-76, I-80, I-129, I-180, and I-480. Other modes of transportation such as railroads can be used on tracks like the Union Pacific Railroad. Notable colleges in the state are The University of Nebraska-Lincoln and York College. Major attractions include baseball games at the stadium of the Nebraska Storm Chasers.